I've been taking these exercise classes recently that I think are the most "LA" thing I've done since moving here — they build long, lean muscles through low-impact ballet techniques (thank you, LivingSocial). Recently, this fitness company has been trying to push a cleanse. I'm not here to debate the plusses and minuses of cleansing, but I would like to tell you about the line they keep pitching with — "Want to eliminate sugar cravings once and for all?" OK, eliminating the craving for sugar isn't a bad thing. I'll admit, when I eat less sugar, I don't crave it as much (or what satisfies my craving is generally much less sweet). And I certainly feel better when I'm eating things like fresh fruits and vegetables instead of big ol' slices of cake. Often, when we read about self-help techniques — whether they're for finance, fitness, or something else — the stories that rise to the top are the extreme ones. It makes sense. When people are able to stick to extreme changes, their results are also often extreme. So we celebrate the people who drop 100 pounds or eliminate all discretionary spending. But following the same methods can be incredibly difficult; while all work and no play isn't likely to make you quite as crazy as the guy in "The Shining," it can make you give up on your goals entirely. I'm not saying that extreme plans can't be followed, or that they won't produce great results. But I am saying that they are usually not long-term solutions. Rather, a combination of balance, forming new habits, and mindfulness are the keys to long-term success. Here are some suggestions to try when practicing moderation. 1. Don't Have a "Cheat Day"
Somehow I ended up with subscriptions to multiple women's fitness magazines (don't ask). One of the ideas I see repeated over and over is the cheat day — "A day when I can eat anything I want!" My problem isn't with the day as much as the mindset. If you have to cheat from your normal routine, what does that say about how much you enjoy the other six days of your week? Allowing yourself indulgences is definitely a great way to practice moderation and stay on track for your goals, and delaying gratification has all sorts of benefits, from saving you money (if you decide later that you don't actually want what you were thinking of purchasing) to increasing the enjoyment of your indulgence when you get it. But instead of having a cheat day, try thinking positively about your actions as a whole. Take a two-pronged approach to attacking your goal. First, focus on the end result, and remember that most worthwhile things in life take effort. Then, find ways to enjoy and celebrate the process — whether you're trying out new healthy ingredients, going hiking with someone you love talking to, or organizing a challenge with your friends to see who can come up with the best free night of fun. Then, when you do treat yourself to something, it's just icing on the cake. Speaking of thinking positively...I can't tell you how many times I've eaten too much of a delicious dinner, only to complain about my weight between forkfuls. Or purchased drinks and had a great time with friends, only to start fretting about my bank account. Own your decisions. If you're indulging in something, enjoy the heck out of it. There's little point in treating yourself to something you "like" if you're going to spend your time whining about it. Remember, there is always time for worry in the future. When writing this article, I came upon a HuffPo piece about "The 'Everything in Moderation' Myth." The article's title, however, is more attention-grabbing than accurate. Rather, the piece is more about how people "rationalize eating anything as long as they keep below their daily calorie limit — or put in extra time at the gym." Moderation doesn't mean you should have anything and everything; it means that you're choosing to enjoy things that bring you pleasure. Again, this is an issue of mindfulness. Split that delicious slice of cake with a friend. Get one killer new dress instead of four decent ones. Moderation isn't a free-for-all excuse, it's a way to appreciate things. Go overboard? Don't beat yourself up over slip-ups. Our lives are the result of several decisions and habits that take place over years and years. Vow to do better next time. If you are complaining constantly about your weight, or your budget, or something else, don't just keep complaining — take action! Your life will not change if you do not change it. Make a concrete plan for how you're going to improve your life — one that sets goals and deadlines, but also has some flexibility, so you're more likely to stick to it long-term. Because, well, everything in moderation, right? 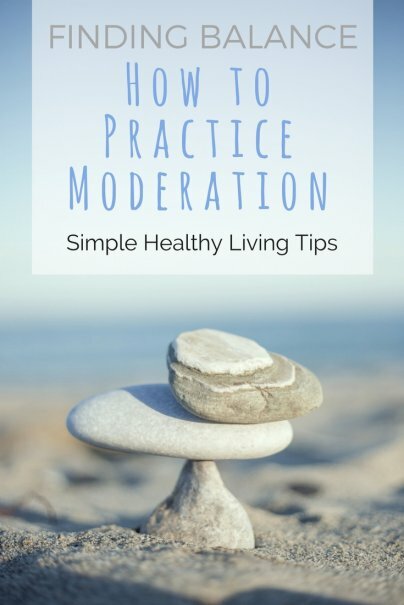 Do you practice moderation? What are your favorite techniques? Share in the comments! I agree if a person decided to eat more than he/she wants then he/she must take ownership of the decisions. That does not mean he/she can't get back on track. "Own your decisions. If you're indulging in something, enjoy the heck out of it." --- Words to live by! Good advice. I certainly agree with number 5. It's all about being congruent. Having your ideas and beliefs aligned with your actions.